What are the options for botox training courses? There are a wide range of botox training courses with different structures, prices, trainers and accreditation. The popular botox training courses are the 1 day condensed procedure course. These can be a combination of online theory and/or classroom plus hands on injection. As a result of the range of courses, the general guidance for the practical element is to achieve the most hands on training as possible on the course. Review as many different patients during the training. If the company does not provide patients for you to inject do not choose this course as you will not gain the confidence required to practice. For example the KT Training botox courses have a unique model program. This ensures their attendees have a range of patients to treat on the training day to achieve the confidence required to practice. The aesthetic diploma have been around for a while. They are mainly theory based and cover a range of procedures. These tend to cover a lot of fundamental knowledge which should be second nature to qualified medical professionals, such as ethics and principles of medicine and most do not provide any practical training. The Level 7 in Aesthetic Medicine course is similar to the aesthetic diploma. This is a new (2018) qualification and some companies are now offering this course. Again this contains a lot of medical basics and can be expensive (£4,000-£5,000++) and time consuming. Due to the recent addition of this course structure we do not have any student feedback on this course, we will have to see how it develops in the future. 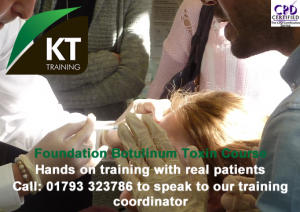 The foundation procedure courses provided by most recognised training providers will enable most medical professional to start practicing with botulinum toxin. These tend to cost between £500-£1000 depending on the company. Please note not all botox training courses will be of the same standard therefore it is recommended you call and ask what will be provided on the course. How long has the company been trading? Established course providers have experience in this field. How many patients will I see on the course? Ensure you get to observe and inject patients during the course. Do you get post course and clinic start up support ? Ask what support you will get before and after training. Do the botox training courses have accreditation? The course selected should have Continuous Professional Development Points (CPD) approved and be covered by indemnity insurance for training purposes.